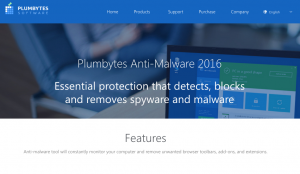 If you are looking for a reliable anti-spyware tool, it is a great time for you to try Plumbytes Anti-malware. After testing this program on our computers, we discovered that it’s light but powerful security software which uses a unique virus detection technology. You don’t need to spend long hours waiting for it to find malware on your computer because Plumbytes is based on a multi-threat algorithm. According to the developer Plumbytes Software LP, this algorithm lets you scan your system 5 times faster than when using other anti-spyware programs. We must admit that we haven’t noticed such difference when comparing Plumbytes scan speed with other anti-spyware programs’ speed. However, it is clear that the software is faster than its competitors. A bonus that comes with Plumbytes is browser anti-hijack protection that provides full protection against browser hijackers. Having in mind that these potentially unwanted programs have become as aggressive as other viruses (ransomware-type threats, rogue anti-spyware and others), there is no doubt that this feature will be used by you almost each day. Of course, you can also reach its IT experts when you cannot remove a stubborn virus on your computer and connect to other great features explained in this Plumbytes review.